The adults are shaking their head. Behind me Miss Freeman mutters something to Mr. Stern about "setting back the movement." I have to stop myself from snorting. What business is it of Miss Freeman's, or any of theirs? They weren't in that room with Paulie when it happened. They didn't get detention from the principal for trying to help their friend, like I did yesterday. They aren't getting called names all day by angry white people, like all of us are. I thought it had to be that way. That I had no choice but to stay quiet, with only my own thoughts to keep me company. I never thought there was any other way to live. When I was Bobby's age, during the war, there used to be blackouts. I'm too little to really remember it, but Mama told me stories. I used to get so scared I'd cry for hours, walking around the dark house, bumping into things, thinking I saw monsters lurking in every corner. But I'm not a little girl anymore. The monsters that lurk now are real. And I can't let them see that I'm afraid. A couple weeks ago I watched Lee Daniels' The Butler and found myself in awe of the way blacks were treated from the 1920-2010. Not only is this an amazing movie, but to watch our history through the eyes of Cecil Gaines is simply fascinating. 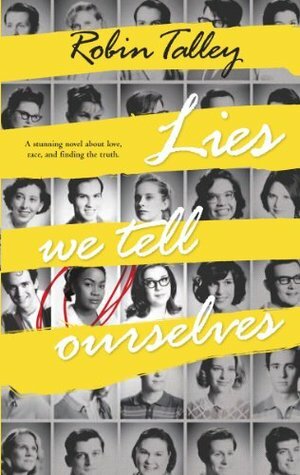 Not long after this, I was approached to review Lies We Tell Ourselves and knew I couldn't pass up this opportunity to read more about this subject. Lies We Tell Ourselves is both amazing and heartbreaking. There were many times while I was reading it that Joe would comment on the concerned looks on my face. I couldn't believe some of the things that were happening to these students. Sarah and nine other students from Johns High School had volunteered to be the first to integrate into Jefferson High School. The school is starting late as the governor closed all the schools that were court ordered to integrate. If that isn't sickening enough, from the very first day these ten students have to face racism and injustice from not only their peers but also some of the teachers. Paper is thrown at them. Awful words said their way. They are followed and harassed from class to class and once they're in class, all the white students move away from them due to their "smell." They're aren't just treated as lower human beings, they're treated as lower lifeforms. While I know that Sarah and Linda are fictional, they're strength is something I cannot but help admire. Sarah goes to Jefferson High everyday, attempting to block out the negative things said and done to her, with her head held high. She is going through what may be the most difficult and horrifying part of her life but she remains strong and knows that what she is doing will change the country for future generations. And despite her daily fear, she continues to fight. Linda begins the story insisting that the students integrating are instigators and they're the ones at fault for everything. She is a popular white girl whose father runs the local newspaper and promotes segregation with every breath in his body. Slowly, through her interaction with Sarah, Linda begins to show her doubt and uncertainty regarding segregation. It's amazing to see Linda's transformation from somebody who believes "separate but equal" to an individual who learns that skin color has nothing to do with personality. That her black classmates are not lesser than her and her friends, but just as capable and in some cases better than those surrounding her. The lesbian angle is interesting as well. Not only are these two young girls going against the social norms of blacks and whites, but they are going against their moral/religious ones as well. They acknowledge to themselves that they have feelings for one another, but worry about God's view on their feelings. While I understand that there are unfortunately still cases of racism and bigotry in today's world, reading about it during a time when the behavior was "normal" and "accepted" really opens your eyes to the fight this group of people went through just to obtain the same rights as white individuals. To see the things people believed in - their black will get on you if you touch them, they're brains don't work the same, they're of lower class and moral fiber - is sickening. I love Lies We Tell Ourselves. The story is incredibly moving. The characters strong, smart, and real. This isn't just a book about growing up black and white or going to school in a newly integrated school in Virginia, or about being gay in the late 1950s. Lies We Tell Ourselves is about growing up and learning to think for ourselves and not what everybody around us is telling us to think. It's about finding our voice when other try to squash it. It's about standing up for what we believe in, for what is right. It's about friendship and love. And it's something you definitely shouldn't miss out on reading.